Being able to toggle between Arcade and Simulation settings was once a staple of NBA Live’s gameplay options. Generally speaking, there wasn’t too much variation in the way that the game played under those settings. Simulation settings automatically enabled all of the rules as well as fatigue, while setting the game to Arcade was a quick way of disabling those elements for a more casual experience. Apart from that, it was basically the same five-on-five gameplay. There weren’t any crazy animations, or mechanics that weren’t normally present. It was basically simulation style for gamers who didn’t care about rules, realistic stats, or strategy. In NBA Live 99 and NBA Live 2000, the Arcade setting was expanded upon to include more fantastic elements on top of disabling rules and fatigue. 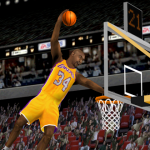 While the same dunking animations were used, the players would occasionally leap high above the rim before slamming it down; in essence, the vertical leaps of NBA Jam with the more realistic dunking animations of NBA Live. In the Nintendo 64 versions, there were cartoonish sound effects when knocking down players or sprinting, and the ball would also catch fire. Three-point shooting abilities were also boosted for all players, though players who couldn’t normally dunk still only performed layups. Of course, without a dedicated tournament mode or true arcade-style elements, the Arcade setting in NBA Live couldn’t quite provide the classic NBA Jam experience. It was more of a sim-arcade hybrid that most of us probably only played when we felt like a break from our Season or Franchise games. I would suggest that those elements were a worthwhile addition, though. They could be a fun change of pace every now and again, and with the appropriate player edits, could be used to create a respectable NBA Jam-inspired roster. With a lot of arcade basketball games being exclusive to the consoles, it was a way of bringing some semblance of the experience to the PC. Personally, while I certainly didn’t want to play with the setting in my Season and Franchise games, I did find myself using it from time to time. I remember my cousin and I playing an exhibition game of NBA Live 99 with Arcade mode enabled, our goal being to see how many points we could score on the CPU without rules to hold us back. As I mentioned in my retrospective of Michael Jordan in 1-on-1, it was also quite useful if you wanted an easier way of unlocking Michael Jordan in the Nintendo 64 version of NBA Live 2000. With a hand check button at your disposal, defeating His Airness became a much simpler task, even on higher difficulty settings. 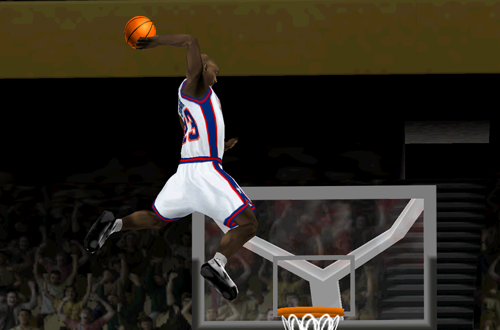 Although the Arcade gameplay setting remained in NBA Live 2001, the exaggerated leaps and other cartoonish elements were gone. This was likely the result of NBA Live 2001 being largely rebuilt; a move that resulted in some notable gameplay issues and the absence of some prominent features in general. The Arcade and Simulation labelling was also used for the different gameplay slider settings in later games, but the arcade elements never returned. This isn’t altogether surprising as they weren’t necessarily widely popular, nor were they a strong selling point with gamers generally wanting to see more and more realism in NBA Live. To that end, it seems unlikely that we’ll see the feature back in NBA Live anytime soon. That’s probably not a bad thing, even though it was a fun idea in its day. Any extra content is generally welcome, and NBA Live should be looking to bring back some ideas from its past, but with the series trying to get to a point where it can feasibly compete with NBA 2K in terms of a realistic experience, adding an Arcade mode shouldn’t be high on the list of priorities. If anything, EA Sports would be much better served bringing back NBA Street and/or NBA Jam. That’d be a far preferable way of catering to fans of the arcade genre, and competing with NBA Playgrounds. If it were to be added again though, it would be a fun throwback. As it stands, it was an enjoyable extra at a time when arcade games were losing some steam. Ironically, the NBA Jam games developed by Acclaim in the late 90s were trying to be more like NBA Live and other sim games, expanding to five-on-five gameplay and adopting a slightly less outrageous style. 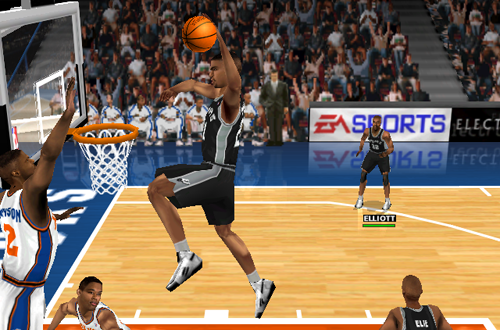 With the addition of Arcade mode, NBA Live 99 and 2000 had their NBA Jam equivalents beat as both an arcade and sim experience. In the absence of a definitive arcade basketball video game like NBA Jam, NBA Jam Tournament Edition, or NBA Hangtime, they offered a viable arcade-like experience. Even though NBA Live’s quality has fluctuated through the years, it’s remained a sim title at heart. The times it did offer an arcade experience, though? Well, it wasn’t too bad at all! It’s also yet another example of how NBA Live used to be jam-packed with modes and features, with something new being added every year. Again, there are other priorities that EA should currently be focusing on in regards to NBA Live, but the underlying concept of adding as much content to the game as possible for a well-rounded product is one that they can still employ today. As for Arcade mode, it may not have been worthy of a Boomshakalaka, but it did pump up the Jam in NBA Live.